The robot (Treadpool) had treads and was capable of firing boulders into high and low goals and penetrating defenses. The robot was very good at shooting and going through most defensive barriers. 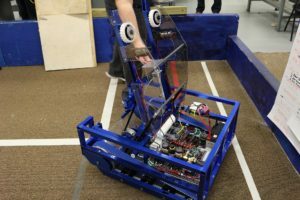 Our robot had a very consistent autonomous period which gave an immediate advantage. It was very exciting the first time that the treads didn’t break! Consistently ranked top 10 at on-season events!